Here are 7 points which I have devised which I feel can help aid in developing a flourishing prayer life. I will like to start off by saying prayer is NOT at all easy. I probably should have mentioned it in the first post. I was someone who used to really DETEST prayer. I remember one time when I was younger my dad said “ok let’s share the grace” I accidently said yes out loud. I would always sigh under my breath when I heard the words “time for prayer”. But now I totally love prayer, couldn’t go a day without it, although there are still days were it is a struggle, but it’s now become a way of life for me. I would also like to note that these points are not in any way compulsory for you to follow, they are more like guidelines. Set a time aside for God EVERY DAY. This is helpful because you know that when it gets to let’s say 6pm its time for your phone to be off, and it’s time for you to prepare to get into the presence of God. Once we discipline ourselves to meet with God every day we gradually form a great habit, which then becomes a way of life. Life can be very busy and emergencies can come up, but I’m sure there is a little moment in the 24 hours which God gives us, just to say God I thank you. Speaking with God on a regular basis helps strengthen our relationship. I say this because there are so many distractions around us in this day and age. Being in a quiet place just helps limit the number of distractions we may face. I fully understand that it can be extremely hard to do so, especially if you have a big family, kids or a new born, but God will surely bless you for all the effort you make. The definition of a quiet place could mean completely different things to two different people i.e. some people can revise with music, whilst others don’t like to hear any noise at all. The point I’m trying to get across is that you know what works best for you. You should choose an environment that will help minimise all distractions and help maximise the authentic time you spend with God! The Holy Spirit is our helper and our guide (John 14:26), so why not ask the Holy Spirit to help you to pray and teach you how to pray. The bible even says that when we do not know what to say during prayer that the Spirit intercedes on our behalf through groans (Romans 8:26). The Spirit provides us with strength, energy and fuel for prayer, the Spirit helps us to live an abundant Christian life. There are so many disturbances which we can face, and life can seem like a total mind battle. When the mind is distracted by the cares and worries of life, it is hard to concentrate on God. I personally believe that the point of prayer is to focus on God, and God alone, giving Him your undivided attention. I usually tell my body “Ok its prayer time, and body you are going to submit to the Spirit of God, so you better behave”. I then go onto tell my mind “Mind don’t worry about the cares of life”. I also take every thought captive to the obedience of Christ, just as it says in 2 Corinthians 10:5. Finally I tell my spirit to “relax in God, trust in Him, and take complete and total authority over the flesh”. For we all know the spirit is willing but the flesh is weak Matthew 26:41. My personal favourite has to be reading the word of God, over the years as I have spent time reading and meditating on God’s word, I noticed a positive change in my prayer life. Once you have the scripture in your heart you can speak the promises of God into existence in your life. You can also use scripture to come against every lie of Satan. For example you can pray along the lines of ‘For God has not given me the spirit of fear, but of power, love and a sound mind’ which is taken from 2 Timothy 1:7. Scripture helps us build a platform for effective prayer as we end up praying for God’s hearts desires which are written in His word. Reading the scripture helps inspire your prayer life! Keep a record of what God drops in your heart for you to pray for. I know this can be particularly tedious for one to do, especially when in your zone (in the holy of holies). I usually find it hard to take notes during my prayer time, but I occasionally jot a few things down before or after prayer time. You can also pray for God to give you the spirit of remembrance, so that you have a record of what God tells you. Also if you’re half way through your day and God just ministers to you, keep record. It’s so nice to look back and see the number of prayers God has answered. 7. Talk to God like a friend and like a father. Just try and picture Him right there in the room, tell Him how your day went, what you struggled with, and never forget to offer Him thanks and praise. Prayer involves you pouring out your heart to your heavenly Father, it’s about being transparent with Him. Sometimes we can overcomplicate prayer and think we have to use fancy words or pray like Pastor John or Deaconess Mary. It’s really about coming to God as you are, like when you talk to a friend or loved one. I’m sure you speak as freely as you choose when with loved ones and you may have your own personal jokes and phrases which you use. That’s how it should be with God. Sometimes I just find myself sitting on my bed and literally saying “God what’s up, what is on your mind today”. Lastly remember that nothing is too small to pray about, God delights in every detail of our life (Psalm 37:23). Hey ladies welcome, welcome, welcome and thanks for stopping by. Firstly I’d like to start off by emphasising on the fact the prayer, is one of the fundamental attributes which helps us as Christians live a fruitful and prosperous life. Prayer helps build a strong foundation for Christian living, I mean if Jesus who is God prayed shouldn’t that alone encourage us to pray. Especially since our goal as Christians is to become more like Christ. Also the bible encourages us to pray without ceasing (1 Thessalonians 5:17). Prayer provides us with a platform to communicate with our heavenly father, to pour out our hearts to God, and to listen to what’s on Gods mind. Prayer is such a powerful tool which we can use to overcome the devil, as the bible says we do not fight against flesh and blood (Ephesians 6:12). Sometimes we can underestimate the power of prayer, but believe me when I say prayer changes situations. So don’t ever think your prayers are hitting the ceiling or think that you’re just talking into an empty space. I can’t lie I’ve felt like that at times, in fact many times, but you gotta keep trusting God and hanging onto His word. Remember the prayer acronym P.US.H. 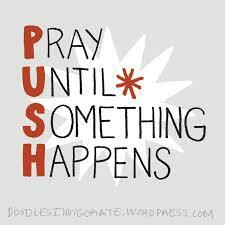 (Pray until something happens), hold onto that and never give up on prayer. Another great aspect of prayer is that it helps aid in spiritual growth, the more time we spend in God’s presence the more we grow, the more we talk to God the more He reveals to us. Doesn’t that just blow you away! When you communicate with God on a daily basis, you will notice a change in your prayer pattern. You may realise that content of your prayer changes, because you find you are praying for what’s on Gods heart. This is not at all to say you were not doing so before. You may also find that you prayer time gradually increases. There is definitely a difference you get when spending more authentic time with God. It’s quite hard to explain, but just trust me on this. If you come close to God, He will come close to you James 4:8. Prayer is also an expression of love, it shows God that we love Him, that He is in our thoughts, and that the time we spend with Him is so valuable. I’m sure we’ve all had those friends that only call us when they need a favour, and it just gets to the point where you feel like ignoring their calls, I’m sure a lot of us have experienced this. I just hope you’re catching my drift here. Sometimes without realising it we can end up only speaking to God when we are in need. We cannot claim we love someone if we only speak to them once in a blue moon. When you love and care about someone, you want to know how their day has been, what they’ve been up to. When you come back from school and your parent or loved one asks you how was school, it’s pretty much an act of love believe it or not. So when you wake up in the morning as an act of love, you could try out by saying a few words to your heavenly Father. As David said “My voice you shall hear in the morning, O LORD; in the morning I will direct my prayer to You, and I will look up” (Psalm 5:3). I could go on and on and on about the importance of prayer literally, but I tried my best to keep the message short and sharp (well in my opinion lol), but I would like to end by saying that we as women have a very important role when it comes to prayer. I say this because I have noticed that in my own church and churches which I have visited, women are the majority of the congregation. This is from my personal experience, and I know that it may not be the case in all churches. This means we as women have the obligation to uplift our children, men, societies, churches and ourselves in prayer constantly. 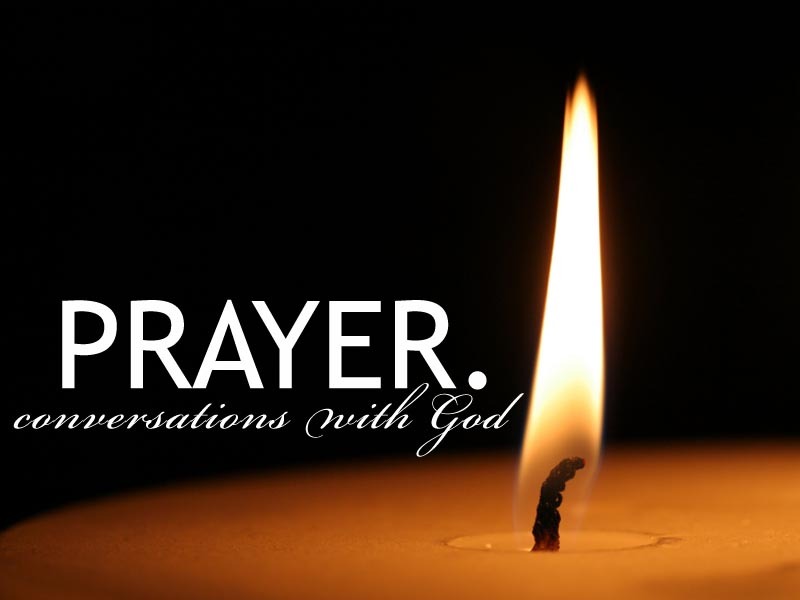 In the next post I will be talking about ways in which we can develop a more effective prayer life.